This article addresses an esoteric topic, and it may be too tedious for those not interested in Chinese history. But for the history buff, I hope this article stirs an interest to follow up on the topic. I have always been fascinated by the many strange names of tribes that appear in Chinese history: Xiongnu 匈奴, Xianbei 鮮卑, Uyghur 回鶻, Rouran 柔然, etc. They sound very alien and distant for me, yet they played a significant role in the development of China and the Chinese culture. After substantial reading about these nomadic tribes, I gained a better understanding of their history and how they interacted. This article discusses the Mongolian steppes and its historic peoples. 1.People occupying lands determine the history and culture of the lands. Small band conquerors impose rules over the occupiers of the lands, but they generally are not large enough to change the signature of the people on the ground. That’s why many nomadic tribes that entered China were assimilated into the Han 漢 gene pool and became extinct. 2.Sedentary people farm the lands and they stay put except under great duress such as famine or threats of violent warfare. 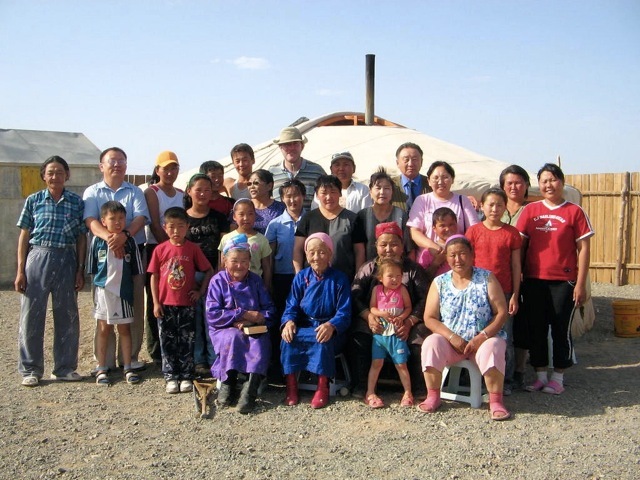 Nomadic people move with their herds and relocate constantly, contributing to the frequent change of occupiers of the Mongolian and Central Asian steppes. 3.Tribes that occupy one area of the steppes sometimes are absorbed by another tribe; or are forced to migrate to another land and their lands was occupied by another tribe. This is how certain tribes appeared in history and then disappeared from historic record. 4.The main ethnicities of the peoples who occupied the steppe lands north of China were the Mongolic and Turkic tribes. Various tribes of different ethnicity often occupied different pieces of the steppes simultaneously. The steppes changed hands among these groups of people from time to time. 5.Tribes that were conquered often merged into the conquering tribes and adopted the names of the conquering tribe. That’s how the small tribe named Mongol 蒙古 grew to be very large and gained strong military strength. 6.The Han people, who make up 92% of China’s population, is a conglomerate of various historic tribes whose genes are mixed up in today’s people. There is no “pure” Han Chinese. Northern Han Chinese were frequently invaded by nomads and their facial features exhibit some of those traits; whereas the Han Chinese of Yangtse River 長江 region exhibit less nomadic characteristics but more of the Yue 百越 and Miao 苗 features. Former Zhao 前趙, Northern Liang 北涼, Xia 胡夏. Mongolic 200 – 550 Wuhuan 烏恒, Xianbei 鮮卑, Rouran 柔然Northern Wei 北魏. Liao 遼, Western Xia 西夏, Mongol Khanate 蒙古帝國, Yuan 元, Northern Yuan 北元. Lived in Manchuria adjacent the steppes. Jin 金, Qing dynasty 清 ruled the steppes. There were other minor ethnic tribes that roamed the steppes and China proper. They included the Qiang 羌; the Tibet 吐蕃 (pronounced “toubot”); the Iranian Caucasic tribes of Yuezhi 月氏; and Central Asian and Arabic immigrants grouped as the Hui 回 nationality. Xiongnu 匈奴 500 – 100BCE – 460CE Unknown ethnicity. Bedeviled China and prompted China to build the Great Wall. After defeated by Han漢 dynasty in 90CE, a remnant migrated west, may became the Huns who threatened the Roman Empire. People of this tribe established Former Zhao 前趙, Northern Liang 北涼, Xia 胡夏 states in 300 – 460CE. Established the Northern Wei 北魏 dynasty, built many Buddhist monuments that can be seen today. A vassal of Xiongnu, was destroyed by CaoCao 曹操 in 207. After being defeated by Gokturk in 552, a remnant migrated west to become the Avar who ravaged Europe. Established Liao 遼 state in 907. The word Cathay is derives from Khitan, and is still used in many countries such as Russia for China. Established the Jin 金 state. Established the largest empire in history. Unified trade routes and facilitated interchange among nations and peoples. In China, the Mongols named themselves Yuan 元, established as Northern Yuan 北元 after being chased from China by Ming 明朝 in 1368. Established Qing 清 dynasty and ruled a vast empire. Originated in Siberia, defeated Xiongnu 匈奴 in 158 and ended its dominance. 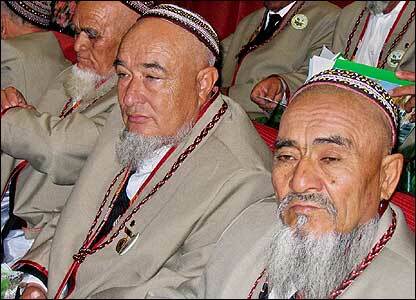 Ancestors of Uyghur. A powerful adversary of Tang 唐 dynasty, but was defeated. Called Tang emperor Tian Khagan 天可汗 and brought China’s influence to Persia in 660. The Uyghur Khaganate was friendly with Tang 唐 China, assisted Tang several times. Uyghur live in Xinjiang today. Residing today in Central Asia, primarily in Kyrgyzstan. Mongolic features are the familiar East Asian face. Turkic peoples have the facial features of mixed Mongolic and Caucasic tribes, live in Central Asia where the two ethnic groups met and mingled. Turkey the eurasian nation is derived from the Ottoman Empire, established by a Turkic tribe that left the Mongolian steppes, settled in Middle East and proceeded to conquer. 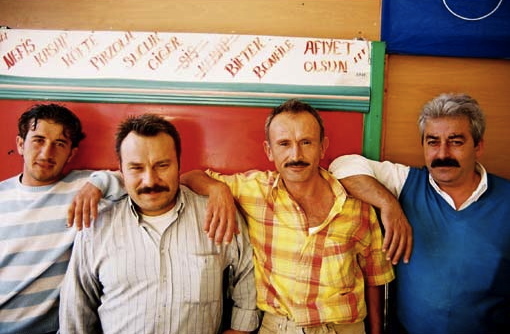 Yet the Turkish people look quite different from the Turkic peoples of Central Asia. As the small Turkic tribe migrated from Central Asia to Middle East, their genes mixed with the numerous local people in Middle East and became quite diluted. Posted by Robert Wu on Sunday, December 4, 2011, at 11:11 pm. Filed under Uncategorized. Follow any responses to this post with its comments RSS feed. You can post a comment or trackback from your blog.